Available in a 5 oz. Plastic shaker bottle. Rub this seasoning generously on steaks, poultry, or seafood. Great on ribs and pork too! Available in a oz. Plastic shaker bottle. 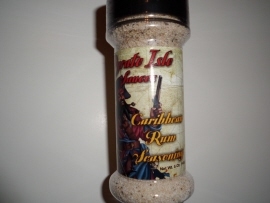 Ingredients: Garlic, Salt, Cane Sugar, Onion, Chilies, Guava Oil, Mango Oil, and Spices. Great on Chicken, Chops, or Salads. At first, a taste of citrus, then a tiny tang of habanero. One of our best sellers! Ingredients: Garlic Salt, Cane Sugar, Onion, Chile Peppers, Orange Oil, and Spices. For chicken, pork, or beef. On the flat-top grill or pan-fried.